This registered cover was sent from Port-au-Prince on the west coast of Hispaniola. The sender used a purple oval stamp to identify himself. The sender requested use of the S.S. Prins Willem I. The S.S. Prins Willem I was built by Nederlandsche Scheepsbouw Mij, Amsterdam in 1901. Koninklijke West-Indische Maildienst (Royal West Indian Mail Service) owned the ship. The vessel's vital statistics were: 1764 grt; 86x12 m; 11 kn; 46 passengers in 2 classes + 40 steerage). It was employed on the Amsterdam-Paramaribo-New York route. It was sold to Bombay owners as AHMEDI 1920 and finally broken up 1935. 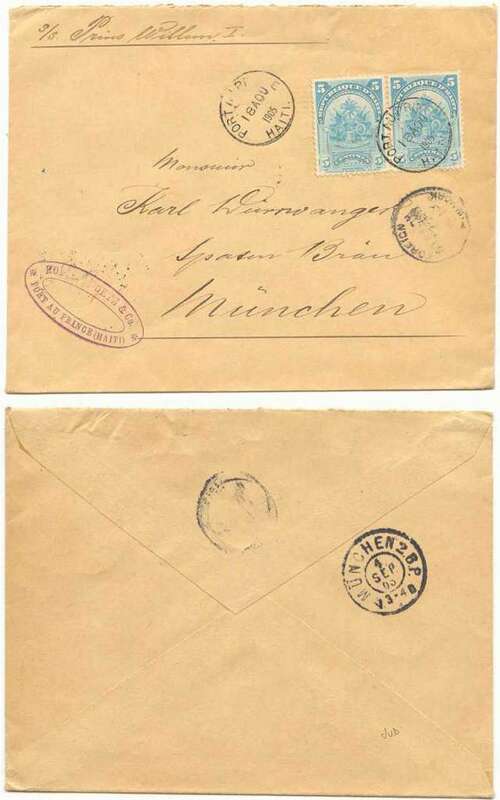 The cover is franked with two 1899 5 c. pale blue Coat of Arms (Scott 59). The stamps were cancelled with two Port-au-Prince CDS. Service from Haiti to Europe went by way of New York City. on both sides of the cover with dates which suggest August 25. There is a receiving CDS on the back dated September 4. *Thanks to Tony H. of New Zealand for finding this information on the Dutch ship. which was the source of most of the information on the S.S. Prins Willem I.
C.E.A.van Boeckel has died and his website has disappeared.